Located in Stuttgart, we are actively functional as a respectable Manufacturer, Exporter and Supplier of Diamond Core Drilling Unit (CBE350) all over the globe. 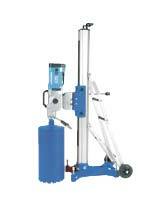 Our Drilling Unit is used to drill into concrete up to Ø 350 mm (optional adaptor ACX400 for drilling up to Ø 400mm). All you have to do is get in touch with us!